As one of the original West Coast rare groove DJs. Greyboy's jazz, funk & soul collection runs deep. Showcasing Greys skills as a DJ, his ear for picking party tunes, & his production prowess, he edits, loops, & cuts-up tracks to enhance listening pleasure. 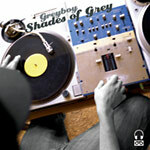 The 1st officially released mix CD captures Greyboy live on the decks. Features funky faves, dirty vinyl, and unrealeased Greyboy exclusives, it's exactly the kind of set you might hear at a Greyboy DJ gig.